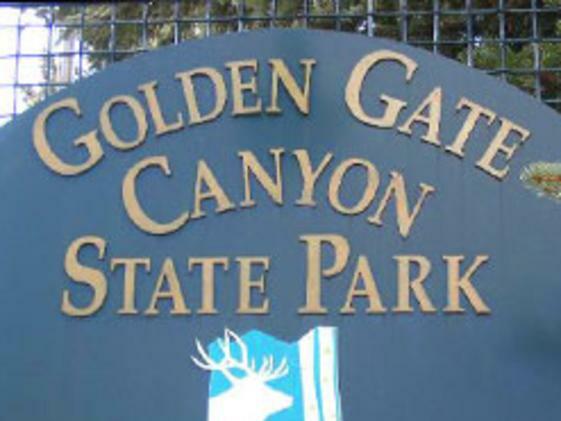 Only 30 miles from Denver, Golden Gate Canyon State Park offers such amenities as a electrical hook-ups and tent-sites in two different campgrounds, stocked fishing ponds and picnic sites. Visitors to the Panorama Point Scenic Overlook can see 100 miles of the Continental Divide. Golden Gate Canton State Park's numerous group facilities can host several types of events, from weddings to family reunions and company picnics. Besides camping, overnight guests at Golden Gate Canyon State Park can also stay at one of the five cabins and two yurts. In 2008, the park began renting out guest houses, a first for a Colorado State Park. Winter will find visitors cross-country skiing, snowshoeing, sledding, ice fishing and ice skating. Over 35 miles of hiking trails in Golden Gate Canyon State Park offer pleasures and challenges for everyone. 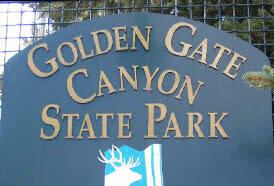 The twelve trails at Golden Gate Canyon are each named after an animal and marked with the animal's footprint. Trail head parking areas are easily accessible from the main roads in the park. Mountain bikes and horses are permitted in the park on multiple-use trails. Ample parking space for horse trailers is provided at the Nott Creek trail head located near the Red Barn Group Picnic Area and at Kriley Overlook above Kriley Pond.